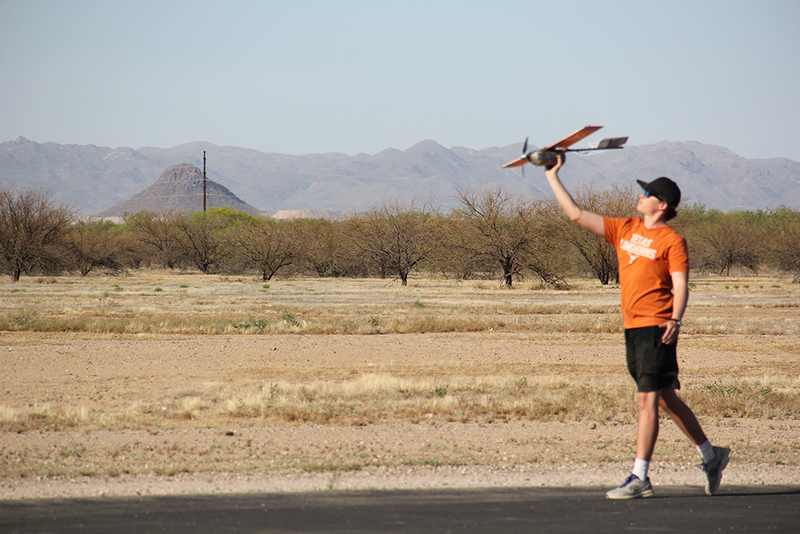 This April, the UT Austin Design/Build/Fly (DBF) team joined about seventy-five teams from around the world in Tucson, Arizona, for the annual international Design/Build/Fly competition hosted by the American Institute of Aeronautics and Astronautics and the Cessna Aircraft Company/Raytheon Missile Systems. 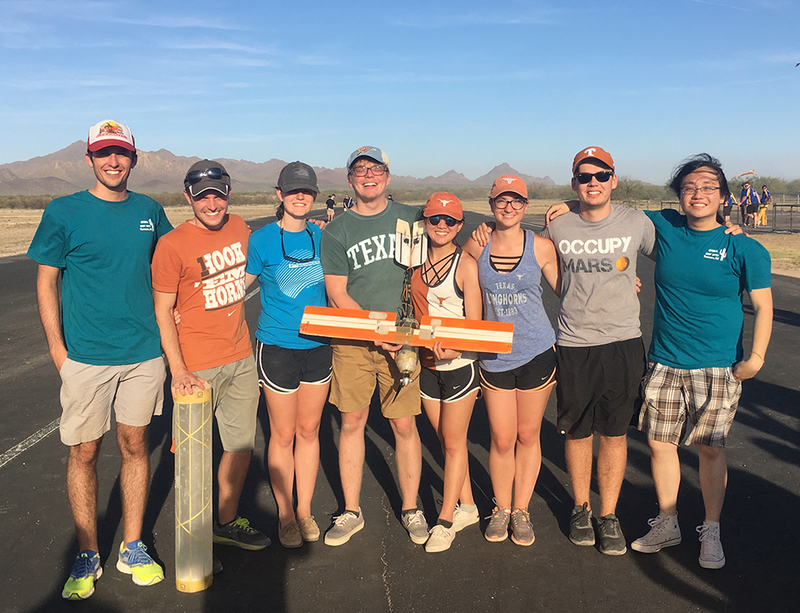 UT aerospace engineering undergraduate students spent the year designing and building an aircraft to complete a series of missions at the competition. Besides flying the aircraft, teams win points for the design report and size of the aircraft — the smaller the better. Though the team was not able to complete all the missions, they still managed to place ahead of other teams that did, due to the high score they received on the report and small size of the aircraft, which the team named Scout. This year’s DBF team consisted of about 40 students who created four sub-teams to work on the aircraft. Because of this year’s mission requirements, they decided to prioritize the size of the aircraft and designed and built one that weighed 1.5 pounds with a wingspan of around 3 feet. Materials used to build the aircraft included fiberglass and polystyrene foam. The team began working on the project in Fall 2016, and by the end of the semester, they had just about finished with the proof of concept. They then spent the spring semester creating different iterations of the plane, improving each new version. “It was fun to say ‘This doesn’t work, that doesn’t work,’ then be able to say, ‘Okay, that does work,’ ” DBF team lead Amy Ekiriwang said. The first mission required folding the aircraft into a tube and then dropping it. Developing a foldable airplane that could automatically lock upon opening presented a particular challenge for the team. So that Scout would be easier to fold, the team made its wings offset. An additional challenge this year was that the aircraft would be hand-launched at the competition, so the team looked at the last hand-launched plane that had been created for this competition a few years ago. They brought that airplane down from the attic and noted what aspects of it were successful and how it could be improved. The aircraft didn’t need wheels to take off since it was going to be hand-launched, so the team left them off, making the aircraft more light-weight. Instead, they reinforced the fuselage so it could skid to a stop. This year's DBF missions required hand-launching the aircraft. View more photos. The competition consisted of four missions. The first was to drop the airplane, folded up inside the tube, from three orientations, without the airplane breaking. The second was to fly the aircraft three laps within five minutes. The third required the airplane to carry three hockey pucks while flying three laps as fast as possible. And the last mission was to fly carrying any number of pucks chosen by the team. The team did well on the first two missions but hit a snag on the third one. Scout could not take off with the hockey pucks. The aircraft was so light that the pucks more than doubled its weight. Because they did not complete the third mission, they could not go on to attempt the fourth one. Ekiriwang said they were concerned about Scout’s ability to lift the weight beforehand but they had tested it out on the previous iteration so felt it would probably be fine. Ekiriwang said the team learned a great deal from the obstacles they faced in the third mission. They managed to stay optimistic, even as they watched Scout fail to take off. Ekiriwang’s favorite part of the competition is the sense of camaraderie that the teams feel with each other. The competition also allows the different sub-teams, who work separately throughout the year, to get to know each other.